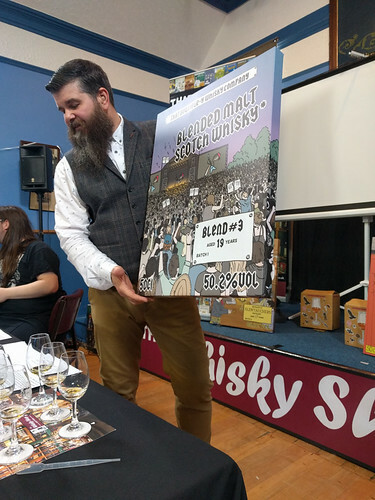 During the Spirit of Speyside festival we attend three events that featured independent bottlers, groups that buy casks through brokers (usually) and then decide when and how to bottle the insides. Thursday evening ‘Whisky Tasting and New Releases’ in Craigellachie Hall. Hosted by two smaller independent bottlers, Spirit Still and Dramfool. Only four tables for this event, but quite fun and informative, with a nice range of interesting whiskies. Carsbridge 51yr – grain whisky from 1964! Brown sugar & vanilla, like a creme brulee, with a little apricot and some oakiness. Very light, a little heat on finish. Tasting it later brought out more coconut and citrus notes, less heat. ‘Burnside’ 18yr (Balvenie with a little Glenfiddich) – A little honey, apple and cherry at first, then clover and spice with some astringency. ‘Give and tell’ (Glenlivet) 25yr – Initial: iodine saltiness, fruit. Big! Light citrus, some honey, fig and raisin, light toffee. Later: earthy, more wood, cinnamon and creaminess. Mike’s fave. The Speyside 22yr – Nose: light sulfur, wine notes. Palate: Sherry! Smooth and rich with lots of cedar and leather. Later: more fruit and chocolate. Reminiscent of a Loch Gorm. Eric’s fave. ‘Like a Villan’ (Lagavulin) 15yr – Nose: fruit and peat. Palate: medium smoke, some salt and metallic notes, smooth with a slightly astringent finish. 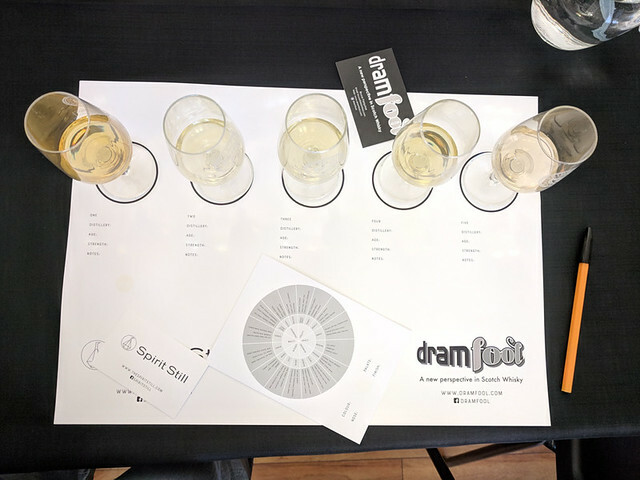 A Friday afternoon tasting in St James Hall, Dufftown. The only event we actually had our names checked. 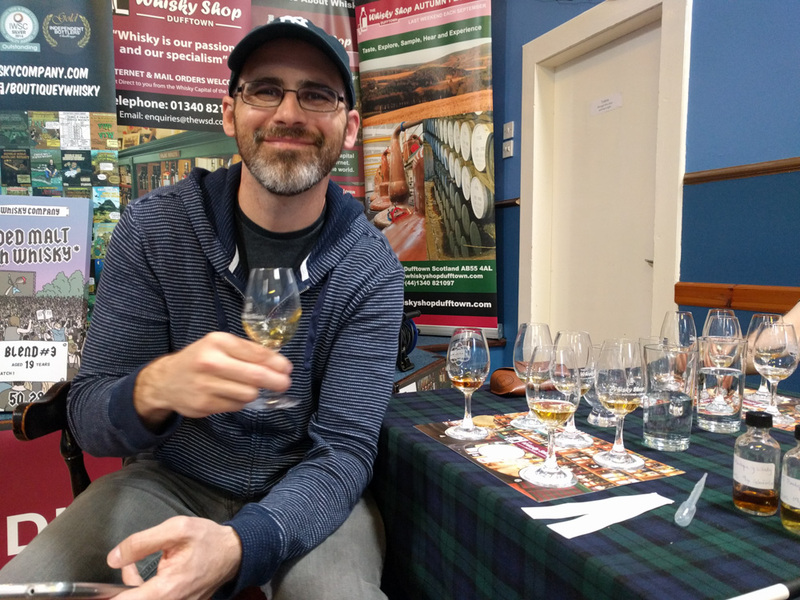 Whiskies were pleasant, but we felt a bit rushed the whole time – definitely less informative than the New Releases tasting on Thursday. Glenallachie 8yr (51.7%) Nose: medicinal. Palate: vanilla, heather, fig, honey. Dry finish, tingly. Some sulfur later on. Tormore 21yr (46.8%) Nose: grassy, floral. Palate: creamy, flower. Tingly finish. GlenTauchers 17yr (48.8%) Nose: woodiness. Palate: creamy, vanilla, cherry and lt apricot. Lots of wood. Ballantine blend component. Glenfarclas 9yr (51.7%) Nose: Astringent, light leather, a little vegetable. Palate: big oak and cedar, fruit from the Sherry. Creamier with water, nose is nicer too. Glenfiddich 19 yr teaspoon malt (50.2%) Nose: light fruit, berry. Palate: honey, tropical fruit, lovely and light. More spice on nose with water. Mortlach 22 yr (52.6%) Nose: light smoke. Palate: nice smoke, rich with some fruit. Friday afternoon tasting in the Quaich bar. 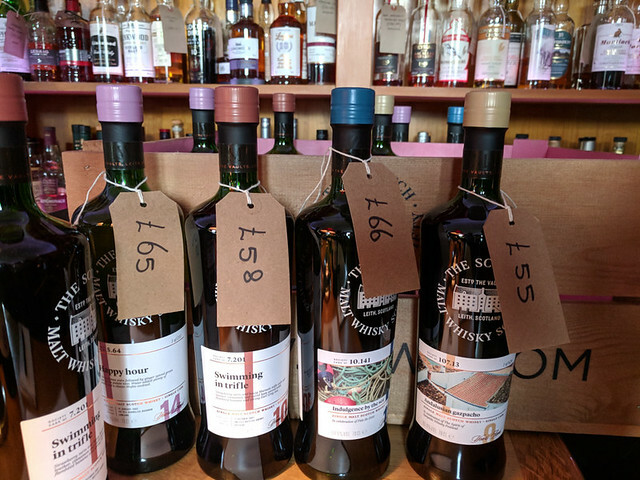 This was an informal tasting with two reps from SMWS, and it was quite fun to try these cask bottlings. ‘Andalusian gazpacho’ (Glenallachie) – Nose: fig, grape, Sherryesque. Nice light peat, rich chocolate and fruit, very nice. Eric’s fave. ‘Swimming in trifle’ – Nose: strong, mellows with water. Ginger, rose and biscuit. ‘Indulgence by the sea’ (Bunnahabhain) – Nice with some smoke and iodine, but quite light.